Bronte Mettlestone’s parents ran away to have adventures when she was a baby, leaving her to be raised by her Aunt Isabelle and the Butler. She’s had a perfectly pleasant childhood of afternoon teas and riding lessons - and no adventures, thank you very much. Jaclyn Moriarty is one of the most inventive and refreshing voices in contemporary young adult literature, from the authentic teen voices in her Ashbury Brookfield novels to the incredible world of her Colours of Madeleine series. 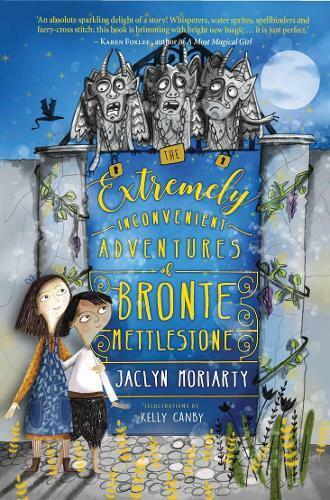 The Extremely Inconvenient Adventures of Bronte Mettlestone is her first book for middle grade readers and it’s exactly the kind of ironically whimsical offering that only Moriarty can give us. When ten-year-old Bronte Mettlestone learns that her reckless adventure-chasing parents have been killed by pirates she’s not surprised. But then she learns that their magical will requires her to leave her home with Aunt Isabelle, and journey alone to visit her ten other aunts across the kingdoms. Our sensible young heroine knows there’s no point arguing with Faery cross-stitch, and so off she heads for a daring adventure of her own. Moriarty’s world-building is wonderfully imaginative and uniquely hers, while Kelly Canby’s energetic illustrations are a delight. This jam-packed, chunky novel is ideal for book-devouring readers in upper primary school.